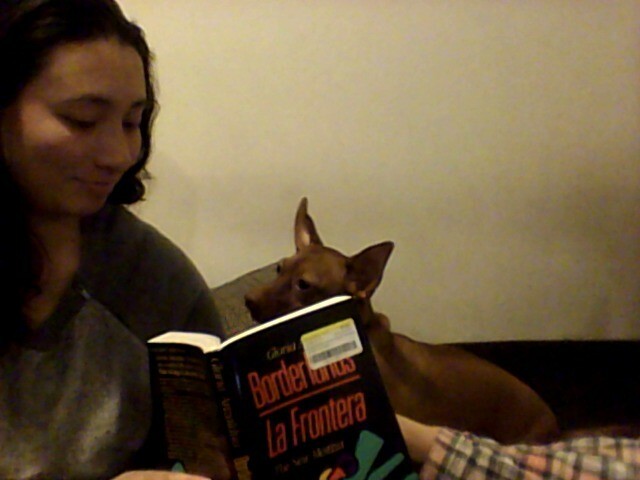 This past month, your favorite QTPOC think tank/cuddle collective has been reading Borderlands/La Frontera by Gloria Anzaldúa. There was a lot going on in this one, so let’s talk about it! 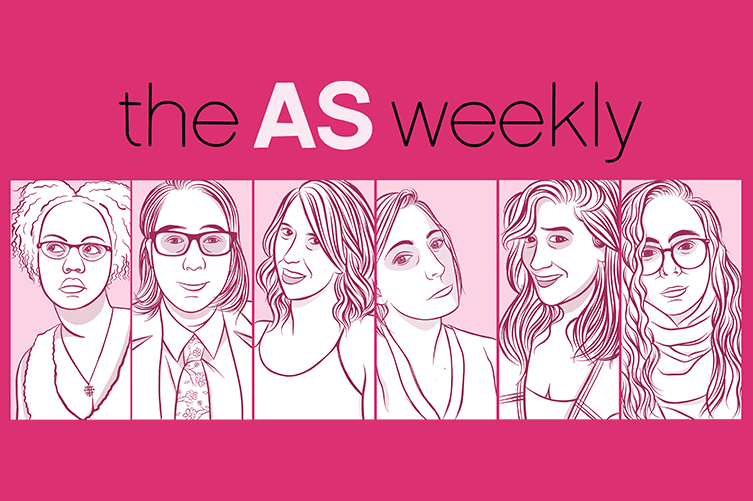 Here are some Speakeasy members with their brilliant thoughts, gorgeous faces and favorite quotes. Growing up, adults never hesitated to remind me that I was a motor-mouthed, bossy, determined child. I didn’t say yes ma’am or no ma’am, I talked back to adults, and would not hesitate to tell you if I didn’t like something. I grew up thinking I was a bad girl because good girls didn’t act the way I acted. Looking back I wasn’t good or bad, I was just a child who was clear about what I liked and didn’t like. I wasn’t the only person who received this good girl bad girl messaging growing up. I can’t tell you how many times I saw girls being torn to shreds by mothers, sisters, friends, and elders because they felt comfortable with their sexuality, their body, and their opinions. Comfort and confidence within themselves marked them as rebels because it meant they were thumbing their nose to the respectability politics that was being forced on them by cultural tyrants. Being a woman means you are corralled and forced into submission by the community at large, but you are still part of it. 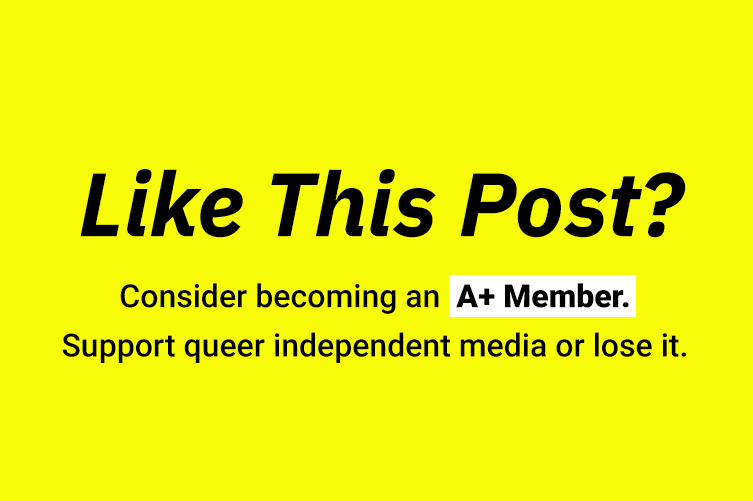 Being a lesbian, though, means you could lose your place in your community. Parents have told children not to come home, siblings have stopped returning calls, and countless other stories of homes being ripped out from under one’s feet because how you love is deemed as “deviant.” It’s why I waited so long to come out because I didn’t want to lose my home. I didn’t want the only thing I had ever known to be taken away from me. So I ignored my desires in order not to lose everything I loved. I read and re-read those sections because it was crazy seeing how much cultural tyranny has reared its ugly head in my life and those around me. In particular the added impact it causes for those who have intersecting identities that are marked as less than. I’m happy that Anzaldúa is speaking truth to power on these issues, and waging rebellion with her words. To be honest, I really struggled with this book. When I first started reading, I wanted to translate all of the words that weren’t English. If there was something awesome being said, I didn’t want to miss it! I studied a bit of Spanish in high school and college, so I gamely attacked the (super narrow!) margins with my notes, planning to run everything I didn’t know through Google translate when I got back to a computer. That lasted like, not even 20 pages. I do most of my reading on my morning subway commute, which doesn’t really lend itself to this activity. Actually it doesn’t lend itself to reading heavy, theory-laden books at all… But that’s a problem with me, I guess, not the text. I’m just saying: this wasn’t a light read, nor a super enjoyable one for me. I went on this way for several chapters, until I read a passage in “How To Tame A Wild Tongue” that stopped me dead in my tracks. Because oh my God. Yes. I get it. What Anzaldúa did with her writing — leaving the reader to make their own translations, rather than her bending over backwards to accommodate then — was so, so important. I love that idea, even if the result is a work that’s less accessible to me as an individual. That’s kind of the point. Similarly, her use of dreamlike imagery wasn’t the easiest thing to read, but once I got to her explanation of why she writes in this fashion, everything sort of clicked. I’m still not a huge fan of her poetic departures, but I understand why she did it and I respect it. Poetry makes me feel illiterate, sometimes. But I guess if that’s what it takes to get to understanding, I’m okay with it. In general, I think that’s what Anzaldúa is absolutely genius at: putting into words some of the nebulous feelings that I (and others) have had but was never able to solidify into sentences. As a biracial person, I really loved all the things she said about straddling identities and crossing borders. I think she gets a little out there and utopian by the end (at one point she says that gay people link whites with extraterrestrials?? ), but because there was so much metaphor going over my head in other parts, it seems like a safe assumption to say that I may have missed something there. If anyone wants to explain it to me, I’d really appreciate it. Borderlands has been such an influential book for me. I found it particularly validating that Anzaldúa embraces her indigenous heritage in a way that most of us mestizo/as have not. I found myself missing a heritage, a history, that should have been mine but was denied to me. All the time I was reading Borderlands, I felt an ache in my heart, the ache of homesickness. I felt a longing to return to my childhood hometown, where everyone spoke Spanish or Spanglish. I could really relate to the feeling of straddling two cultures and not fully belonging to either one. Sometimes I fear that I’ve become too “gabacha,” too white, to feel like I can authentically embrace a Latina identity. At the same time, I know that my heritage and upbringing are not completely white American, either. Borderlands made me hope for a place, even if it’s not a physical one, in which those of us with mixed heritages can create a place of belonging for ourselves, where we are never too much this or not enough that. “How to Tame a Wild Tongue” really resonated with me, and it made me think more about how language is used to colonize, exclude, enforce racial hierarchies, and delegitimize others. While I’ll never know how it feels to be Latina or Chicana in the US, I could draw many parallels to my own experiences as an Asian American QPOC, such as Anzaldúa being punished for speaking Spanish at school, being dismissed when explaining how to pronounce one’s name, being shamed for speaking accented English by white folks while simultaneously being shamed for not speaking “real” Spanish by one’s own community. I was raised in a sort of borderland. 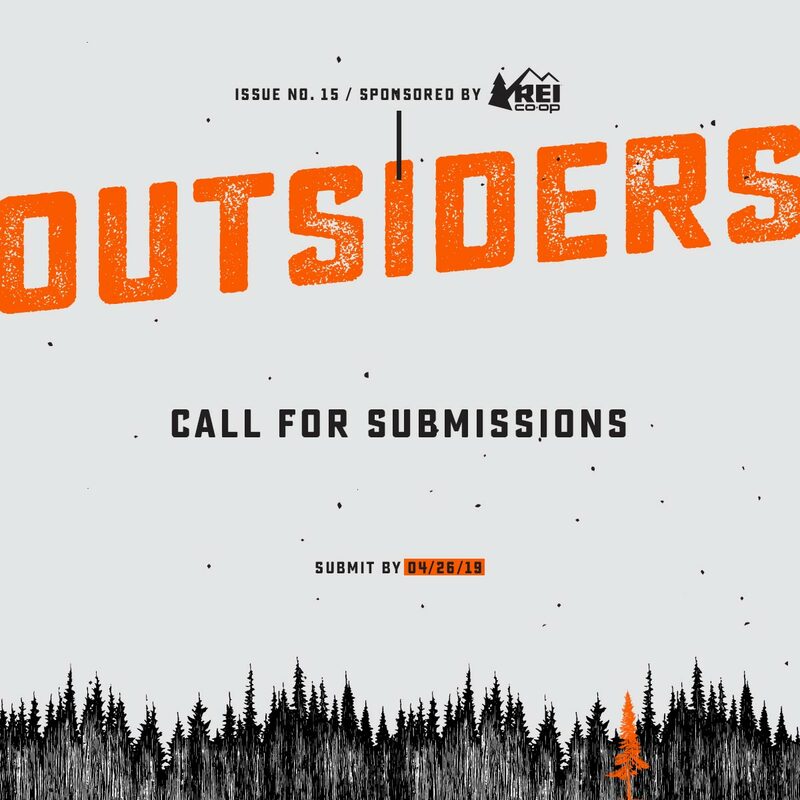 As Anzaldúa writes, there are physical borderlands, psychological borderlands, borderlands that are “present wherever two or more cultures edge each other, where people of different races occupy the same territory.” I grew up in an area of predominately white people and East Asians, with racial dynamics that were full of anti-Asian microaggressions. Mandarin Chinese was my first language, and I spoke English with a Chinese accent for the first 4 years of my life. Growing up, I lost my Chinese accent, and I witnessed my parents (both trilingual) overtly or subtly dismissed, disrespected, or ridiculed for their accented English. Only recently I learned that my mother got her Americanized name when a racist graduate school administrator took one look at her name on the roster and said, “Well. That’s not going to happen. From now on I’ll call you Terry.” It made me so angry to learn of this, especially later in life. There was a sense of violence and violation. I resented completely how this one tiny act bore its way through time and space, and how one insignificant and racist person (my mom doesn’t even remember her name anymore, ha ha) could have had such an impact on my mother’s personal identity, and in part, on mine and my family’s. God, I don’t even know where to begin to tell you how much this book reverberated with me. 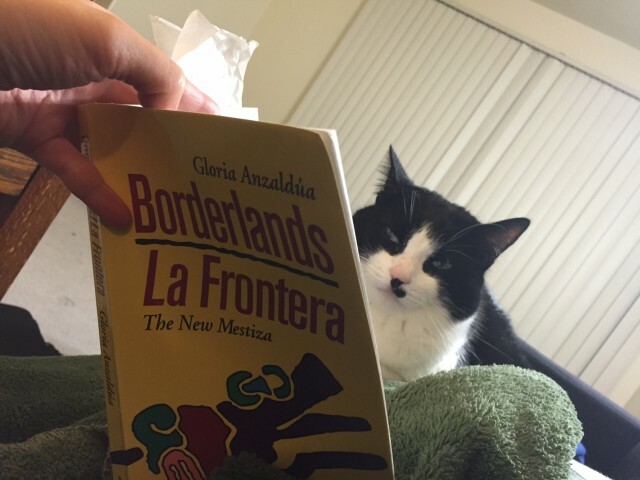 I started reading Borderlands while I was on an early morning flight to the Valley, my home and the borderland that is central to Gloria Anzaldúa’s book. I don’t know if it was because it was 8 a.m., I was sleep deprived and highly caffeinated but reading this book on a plane was such an outer body experience. I don’t know how to explain it — I was up in the air, in this weird limbo, flying from Dallas to the Valley, to the same place Gloria is talking about in her book, dissecting her identities and feelings, many of which are similar to mine. In “The Strength in my Rebellion,” Anzaldúa writes “I had to leave home to find myself…” and I was like me too, Gloria, me too. 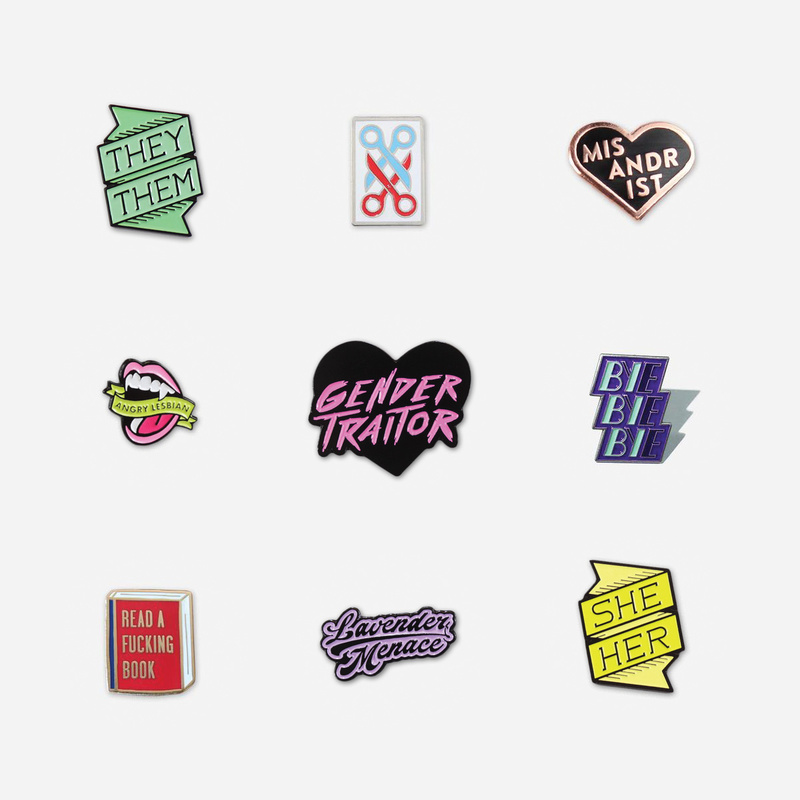 I left my home for college but mostly because I couldn’t be my queer self in the Valley; I felt ashamed, I was filled with anxiety and didn’t like the way I felt when I was there. I had to leave. I did leave and I learned to love myself and accept all of my queerness. In Chapter 2 “Movimientos de rebeldia y las culturas que traicionan,” Gloria writes more about the internal conflict she felt for leaving her home, what her family and culture thought of her for doing so, what it meant for her identity and about this fear she feels going home, yet how her home permeates her very being. That’s how exactly how I feel too. It’s been 6 years since I’ve left the Valley but the Valley is alive inside of me, wherever I go. It seems Anzaldúa’s “How To Tame A Wild Tongue” resonated with lots of us. When I read that chapter, I felt like everything finally clicked, like every single linguistic struggle I’ve experienced made sense and I no longer felt ashamed. I grew up speaking what Anzaldúa calls Chicano Spanish, a language made by the borderlands, and I always felt bad for not speaking “proper” Spanish. When I studied abroad in Spain, I was part of a small program, only 7 girls, with the majority of them being white. My instructors and my classmates expected my Spanish, along with my other Latina classmate’s, to be stellar. Both of us grew up speaking Spanish with our families so of course they thought the language barrier wouldn’t be a problem in Spain. 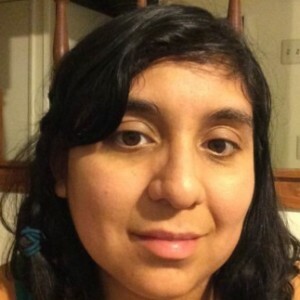 I can’t speak on behalf of my Latina classmate but I know for sure I struggled with communicating in Spain, even more so than my white classmates who learned formal Spanish in the classroom. I was never taught Spanish; I was born into it so I didn’t know how to write or read it until I learned in high school and college. I only knew the words my family shared with me, making it difficult for me to unlearn them and use the “correct” words. While my study abroad classmates discussed things in class with their textbook Spanish in an American accent, I spoke with my hybrid language that everyone thought was wrong. My girlfriend’s Spanish is perfect. She was born in Mexico and her parents only speak Spanish. She’s always corrected my Spanish for fear that we’ll forget it, mostly that I’ll forget it because I don’t speak it on a daily basis like I use to in the Valley. She tells me I’m not pronouncing things right or the accent is on this letter, not that one or you’re missing a syllable or no, that’s not even the right word. I know she means well but I can’t help but feel embarrassed about the Spanish I speak. In chapter 5, Anzaldúa breaks down how Chicano Spanish came to be and describes the evolution of how we pronounce certain words in our vernacular. It wasn’t until reading her words that I realized the language I speak is legitimate, that I shouldn’t be ashamed of the language that was passed down to me. It’s not the same language that was passed down to my girlfriend or the one found in textbooks. It is mine, a “secret language” and it lets me communicate my true realities. So what did you all think? Don’t be shy. 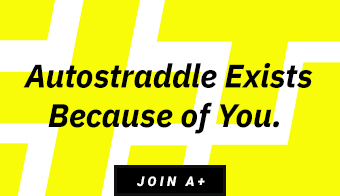 This discussion is open to the entire Autostraddle community, and we want to talk to you! What did you think about Anzaldúa’s use of language? Did the structure work for you? What intersecting identities do you have, and how do you think that impacted your reading? Did you translate as you read? Why or why not? What’s your favorite Gloria Anzaldúa quote? 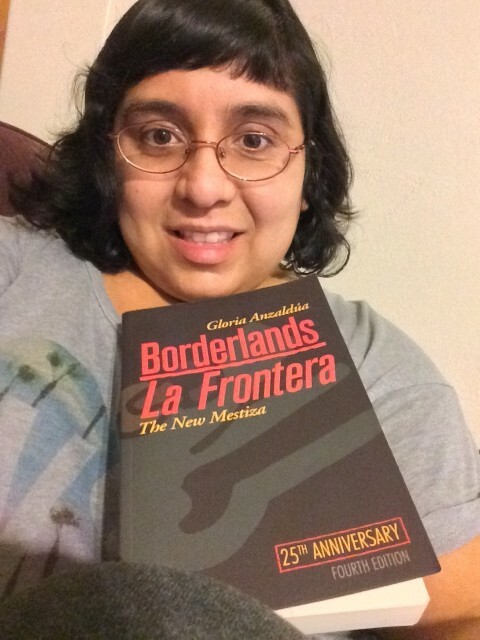 If you haven’t picked up Borderlands/La Frontera yet, publisher Aunt Lute has it on sale at a 20% discount! 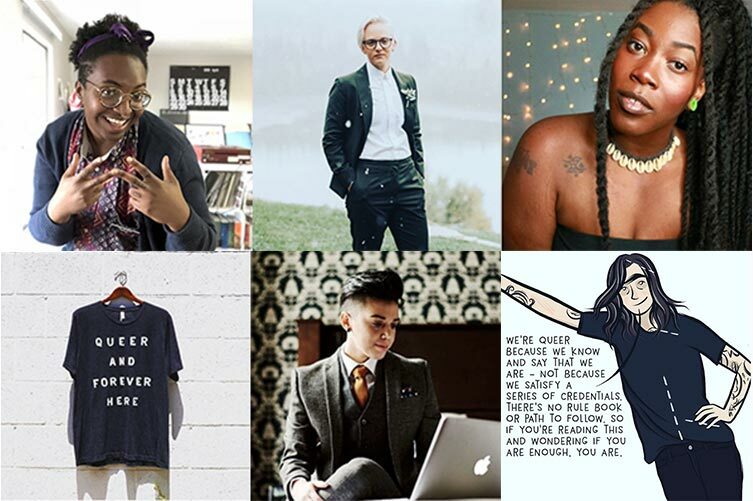 Aunt Lute Books is a non-profit publishing press that publishes women and highlights the work of women of color and queer women, including Speakeasy favorite Audre Lorde. 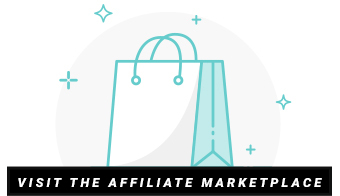 Thank you all for sharing your thoughts and your personal experiences! 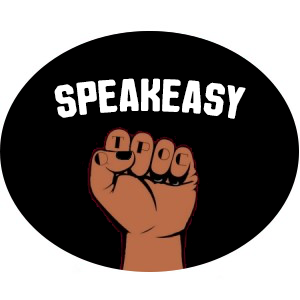 I love the Speakeasy bookclub because I love hearing what ya’ll have to say! 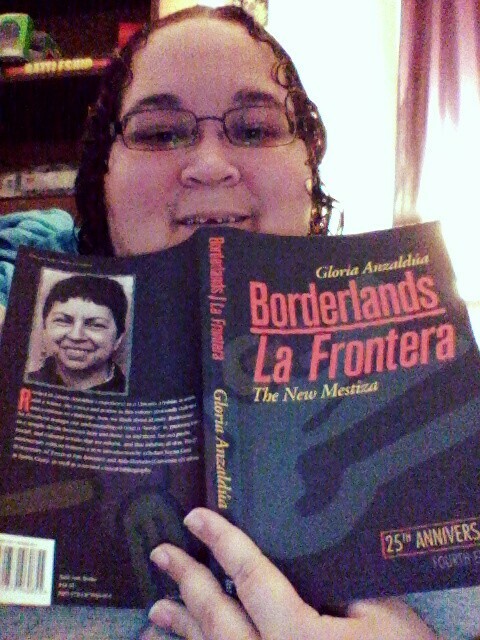 Life happened and so I didn’t get to read very far in Borderlands/La Frontera. I also found that I struggled with the language too. I wanted to understand every single word. I think knowing a tiny bit of Spanish (super tiny, really) made it a little harder in a sense, because I understood just enough to know that I wasn’t getting the whole picture. I realized though, that it was completely my issue and it was something I had to sit with for a minute. But in the end, it made me think more about Anzaldúa and what she was trying to say about her identity. It made me think about my friends and students who navigate life in two languages in a country that doesn’t attribute value to being bilingual (except maybe if you’re white). It ended up being a point of connection for me. From what little bit I did read, I found home in this book. Anzaldúa writes that borderlands are “present wherever two or more cultures edge each other, where people of different races occupy the same territory. As a biracial person, this completely resonated with me. It means I’ve never quite figured out where I fit. Living between cultures means, at least for me, that I never quite feel completely at home – a feeling that is only compounded by my sexual identity. From what I’ve read so far, I actually really like Anzaldúa’s writing style. It can be hard for me to get through a non-fiction book no matter how interested I am in the topic. I like her mix of theory and poetry. It changes the experience and I felt like her non-traditional take was another piece of her identity. So far, I’m loving this book. Excuse me while I go read. I had intended to read this book but I couldn’t get a copy in time and life happened but after reading you guys’s reviews I think I’ll still need to grab a copy to read. This book came to me at a time when I was really struggling with my identities. 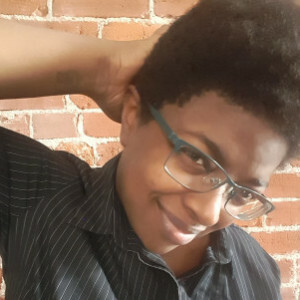 I was just beginning to welcome my queerness, and I was pushing hard against my white experiences, and really longing to reconnect with lo mexicano, which was deep in my system… but too deep to see the surface anymore. I am mexican, born in mexico, lived there until I was 9, and then I lived in central NY for 13ish years. I moved back to Mexico and instantly became very attached to Mexico, and my family, and our food and our history and culture. I wish I could say that I re read this book, because I want to talk about how different I am now that I have reacquainted myself with my roots, but I’m reading harry potter, and I just can’t put it down, lol. sorry. But when I read it then, almost a decade ago, speaking about the borderlands, the meeting places of two or more cultures, it really touched me deep in my heart (Im super corny, i know) I didn’t really live in a place in NY where there were a ton of mexicans, or even that many latinxs, but there were a TON of different types of people. It was a college town that attracted a lot of international students, so my friends were diverse and our borderlands were very mixed, with many flavors, languages, and customs. I didn’t realize how rich my environment was until I went to college in a small jesuit irish catholic school in syracuse, and then all of a sudden I had to choose if I was hanging out with the white kids OR the latino/black kids. I didn’t want to choose. I wanted a diverse group like I’d always felt I had. I got incredibly drunk one night because since my friends weren’t mixing, I was partying with both groups, at opposite ends of the dorm, having one drink at this party, and two more at this other one, and then a few more at this one, and before I knew it I was crying because I felt like belonged in neither group. 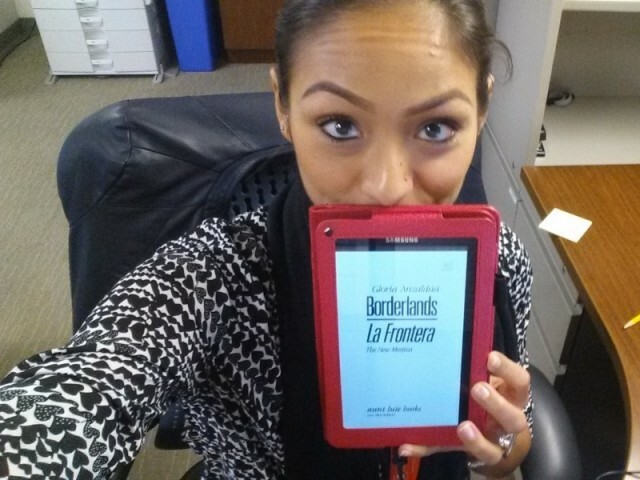 Reading La Frontera helped me feel like I belonged. I did not translate as I read, I switch and speak both, not as often, not in the same ways. I think the use of language helped solidify the borderlands as this place that also exists in language. It’s neither this, nor that, it’s in the middle. 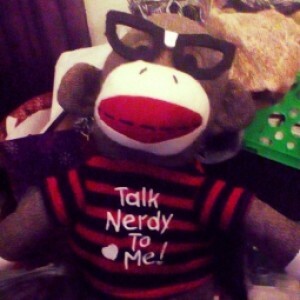 I like to read in bed, on the couch. I like to read where it’s quiet, and cannot focus if there is music or any other outside noises. I had the same frustrations about language when I first read this book ages ago, but kind of let myself fall in love with that anyway. One thing I thought was interesting was the way Anzaldua includes Nahuatl as well as Spanish – Idk for sure, but my guess is that even a reader who knows Spanish really well, would be waaaay less familiar with Indigenous languages. Lots of books make me uncomfortable and many are frustratingly difficult to comprehend (looking at you Judith Butler), but it’s hard to make those things physically happen on the page and for the latter to be a productive experience (again, looking at you, Judy). That alone made me love this book. Aaaand beyond that, when I read this I was going through some things and this book spoke to some of that, although I don’t talk about it very much ’cause I am a white queer-girl and experiences are not analogous and I try to stay out of the territory of appropriation. 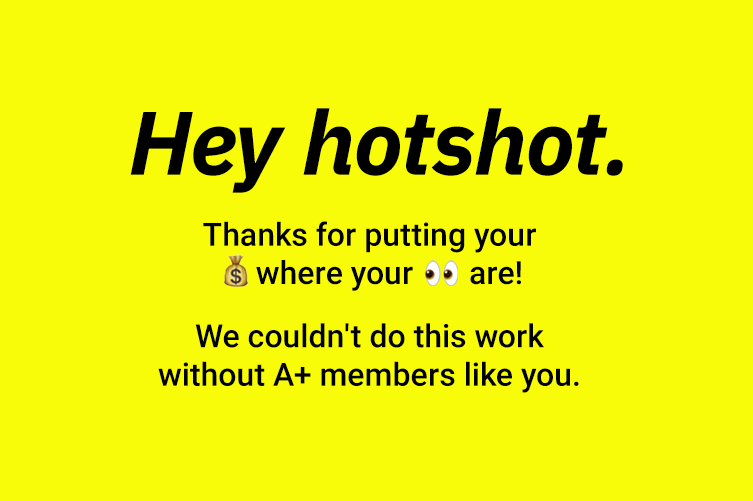 I know I’m really late to this party, but I just wanted to say that I really appreciate the Speakeasy Book Club and hope this keeps happening. I’ve picked up both Sister Outsider and Borderlands/La Frontera, though in both cases after the fact. Reading people’s responses to the books is inspiring and fascinating, and I am looking forward to the next one.